The most common computer memory types are RAM. Random Access Memory, commonly referred to as RAM, is the cheapest way to improve the efficiency of your computer. It is volatile memory; that is, what’s held in RAM is only held there as long as the computer is on. If the data isn’t moved to the hard drive before the computer is turned off, the data stored in RAM is flushed away. RAM also plays a huge part in the number of programs a computer can run simultaneously. If you’ve ever wondered why your computer may buckle under the pressure if 5 or 6 memory-demanding programs run at the same time, it’s probably because it doesn’t have enough RAM capacity to support them all. There are different computer memory types of RAM, and RAM itself has changed over the years. 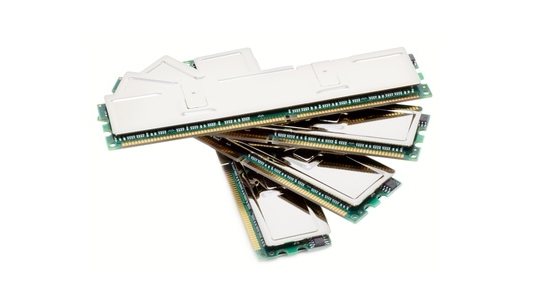 In more recent years, SDRAM (Synchronous RAM) is some of the oldest RAM you can currently find. You’ll find this type of RAM in computers at least 15 years old or more. It is very slow, maxing out at 133 MHz. DDR (Double Data Rate) SDRAM improved on this greatly, generally running at 333 MHz. RDRAM, otherwise known as Rambus RDRAM, was the standard in computers for a while at the beginning of the 21st century, but its high cost quickly put it out of favor with computer manufacturers. Some of the computers that use Rambus memory are still around today, however. Currently, there are three main computer memory types of RAM: DRAM (Dynamic RAM) is the cheapest type. It uses capacitors to store information and needs to be refreshed every 15 nanoseconds or so in order to continue storing that information. It behaves a lot like previous iterations of RAM. SRAM (Static RAM) is the exact opposite. While dynamic memory constantly needs updating, static memory doesn’t need to be refreshed at all. SRAM uses logical gates to store information, providing faster access; however, it’s more expensive than DRAM. There are other computer memory types as well. NVRAM, or Non-volatile RAM, is a type of RAM that actually saves data in case of a shut-off or power loss; however, a separate battery is needed to use this capability. FRAM, or Ferroelectric RAM, is a favorite type of RAM to use in mobile devices because it doesn’t require a great deal of power to run. It reads and writes almost as fast as DRAM; however, since it’s geared more toward mobile devices, it can’t hold nearly as much information in memory.